This multi-media instructor-centered CBT MCSE Exam 70-285 training program teaches students the skills and knowledge needed to effectively upgrade from prior versions of Exchange Server 2003 and work with this technology within an enterprise network. This course was developed for senior IT specialists with multiple years of network experience, in addition to a year of experience designing infrastructure for messaging systems. 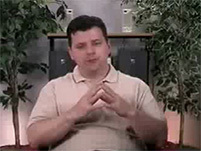 Clay Leitzke -MCT, MCSE, MCSE 2003 Messaging, CCNA, SCNP - Clay is certified as a Microsoft trainer. He has taught courses nationwide, and his expert instruction is present in these CBTs and videos. Clay currently serves as Nexus Worldwide Computer Trainings' Chief Instructor for the MCSA and Windows 2000/2003 bootcamps. Additionally, he assists with development of the Windows 2000/2003 boot camp lab manuals and course content. Clay also served as Global Knowledge Network's lead instructor. For the excellent instruction he has provided at these bootcamps, Clay has been awarded 12 awards.